Female Bornean orangutans (Pongo pygmaeus wurmbii) are mainly solitary and philopatric, leading to adult female relatives sharing adjacent and overlapping home ranges. Females tend to be intolerant of unrelated females, with whom they also may have overlapping home ranges. However, fights that lead to injuries are extremely rare and lethal aggression had never been observed. Here, we report the first case of lethal female-female aggression during over 26,000 h of focal data collected on adult females at Tuanan, Central Kalimantan: A young female, who had recently lost her infant, attacked an old resident female. The interaction’s unique feature was that the attacking female was supported by an unflanged male, who had been in consort with her during the week preceding the attack and was responsible for the lethal injuries to the victim. The victim received protection from a flanged male who was probably attracted to the noise generated by the fight. 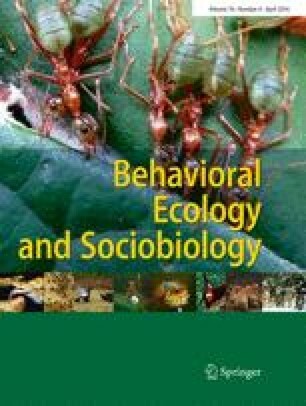 We conclude that even in a species in which coercion is frequently observed in male-female interactions, female leverage over males can coax males into providing services, such as coalitionary support. In this paper, we report the first observed case of female-female lethal aggression in orangutans. This case was extraordinary because the attacking young female recruited the help of a male, who caused the injuries that eventually killed the old, resident female. The old female that was attacked subsequently received protection from a male. The males were thus in effect acting as hired guns. The effective recruitment of males into conflicts between females is novel and unique among apes. It shows an unsuspected degree of leverage of sexually attractive females over unrelated males and can coax males into providing services, such as coalitionary support, in a species otherwise better known for their sexual coercion by males. The online version of this article (doi: 10.1007/s00265-015-2053-3) contains supplementary material, which is available to authorized users. We gratefully acknowledge the Indonesian Institute of Science (LIPI), the Indonesian State Ministry for Research and Technology (RISTEK), the Director General Departemen Kehutanan (PHKA), Departamen Dalam Negri, the local government in Central Kalimantan, the BKSDA Palangkaraya, the Bornean Orangutan Survival Foundation (BOSF), and the MAWAS in Palangkaraya for their permission and support to conduct this research. We also thank the Fakultas Biologi Universitas Nasional (UNAS) in Jakarta for their collaboration and support for the Tuanan project and in particular Dr. Tatang Mitra Setia. We are indebted to the Tuanan field team for their contribution to data collection, in particular Pak Rahmatd, Pak Yandi, Tono, Idun, Kumpo, Suwi, Abuk, and Wilhelm Osterman as well as many local and foreign students and their financial supporters. For major financial support, we thank the University of Zurich, the A.H. Schultz Stiftung, Philadelphia Zoo, as well as USAID (APS-497-11-000001 to E.R.V.). This research complied with the current national laws of Indonesia. We also thank the two anonymous reviewers for their helpful feedback. All applicable international, national, and/or institutional guidelines for the care and use of animals were followed. This article does not contain any studies with human participants performed by any of the authors. This study was funded by the University of Zurich (grant number not available), A.H. Schultz-Stiftung zur Förderung Primatologischer Forschung (grant number not available), United States Agency for International Development (USA) (APS-497-11-000001), and Philadelphia Zoo (grant number not available).